Great photo prop for your precious newborn! The perfect gift for a woodland baby shower or new mom. 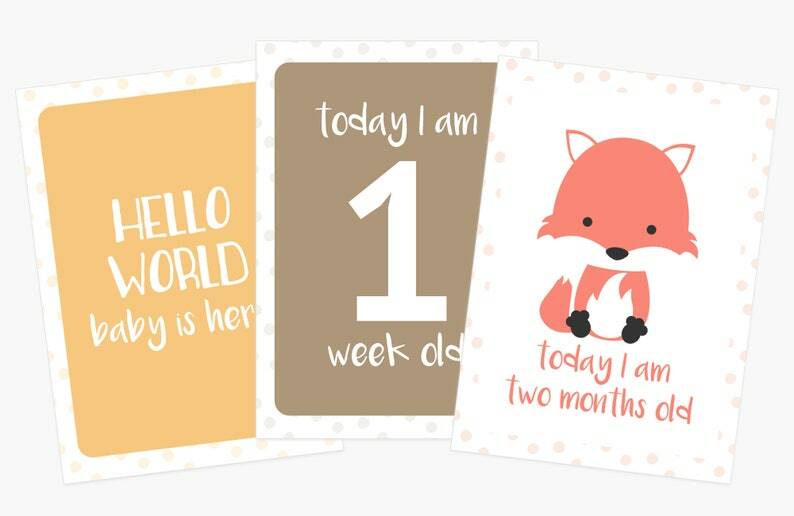 This set includes 25 cards, one to document each of your baby's milestones. Cards are 4.13in x 5.83in and printed on 80lb matte paper stock. Fronts are smooth coated and durable against slobbers, while backs are paper coated and easy to write your child's story on. Each set comes in a white organza back for safe keeping. - Today I took my first steps. - Last night I slept through the night. - Today I rolled over on my very own. - Today I crawled for the fist time. - Today I said mama for the first time. - Today I took my first bath. - Today I smiled for the first time. - Today I pooped my pants. - Today I got my first tooth. - Today I said dada for the first time. Gift wrap includes tissue paper, a bow, and a box. Please specify your gift message for the card & envelope included =). So adorable! Love the jungle animal prints. Seller had a little glitch with the printing equipment causing a delay but was quick to communicate with me the problem. Due to the delay, seller refunded me for part of my order which I totally appreciated. Good customer service. Once received, the bodysuits were perfect! What if I'm not happy with my order? I want you to be 100% happy with your purchase. If you're unhappy for any reason, please message me and I will do my absolute best to resolve it right away. What if my item gets damaged in the mail? I do my best to ship everything securely to avoid bent corners and damaged products. But sometimes things happen in the mail. If your item is damaged in any way, please send me a photo of the damage and I will promptly send you out a replacement. Please contact me directly at goodnightfoxstudio@gmail.com for wholesale pricing! We use high quality, thick paper for all of our products. But in the rare event that you get a paper cut or other injury from using our products, GoodnightFox is not responsible.